This story is presented by Lincoln Institute of Land Policy. Dead malls. Zombie subdivisions. Metastasizing sprawl. Not a horror movie, but the suburbs circa 2014, or at least the media version of them. We’ve all seen the “suburban wasteland” photos from the Great Recession, the parched streets out West, foreclosure signs swinging in their yards. We’ve read about The End of the Suburbs. No wonder the young and the affluent have flocked back to cities: Suburbia’s demise seems imminent, and assured. Except that it’s not. More than half of Americans live in suburbs, and about 75 percent of postwar construction has happened in the suburbs. That is a lot of people, and a lot of built environment, for urbanists to just wish away. One hundred and fifty million or so suburbanites have to live somewhere, and preferably not too far from their places of work, which are mostly in the ’burbs, too: More than three-quarters of jobs in U.S. metropolitan areas are located outside the urban core, and 43 percent are at least 10 miles away. (City living doesn’t look like such an environmental slam-dunk when you consider the number of jobs that require a long commute from downtown.) In Canada, two-thirds of the population lives in suburbs, according to a new study, and five times as many people are settling on the edges of major cities as they are in their cores. The truth is that the suburbs aren’t going anywhere, and the vast, varied landscape of suburbia can’t be reduced to stereotypes, be they old – Leave It to Beaver, Revolutionary Road – or new. 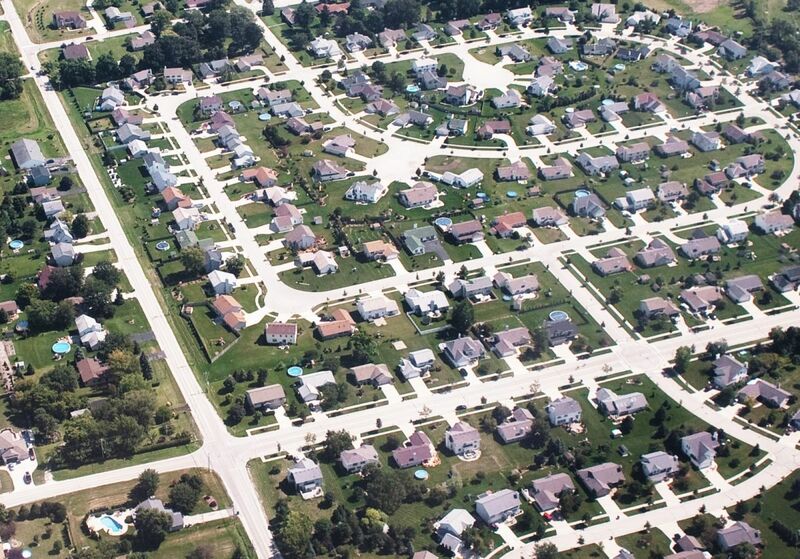 In fact, North America’s suburbs are growing and changing fast. In the U.S., diverse suburban neighborhoods now outnumber diverse city neighborhoods by more than two to one, and diverse suburbs are growing more rapidly than predominantly white ones. Nowhere is this more apparent than on the outskirts of two cities, Washington, D.C., and Toronto. Ethnic diversity in both regions has soared, and development is surging. Two progressive suburban municipalities — Maryland’s Montgomery County and Ontario’s York Region — are trying to steer that growth in similar ways. They’re building high-quality public transit to ease traffic congestion, encouraging mixed-use, high-rise construction instead of more single-family housing, and hoping to wrest social equity out of general affluence. The ’burb boom, of course, can’t be isolated from the bigger boom in city living that has made it cheaper for immigrant families to own a two-story house in a subdivision than a two-bedroom apartment downtown. It’s no coincidence that property values in D.C. and Toronto have spiked to unprecedented highs at the same time that density increases on their periphery. With populations passing one million, Montgomery and York are major urban places in their own right. Spending time in them, you feel like you’re watching the suburb of the future emerge, a place where people of all colors and creeds live in apartments as well as houses, bring tres leches cake and samosas to school bake sales, and hop on the bus to run a quick errand instead of taking the minivan. Already, these new suburbs are changing in more fundamental ways than the gentrifying cities they border. I should know: I live in one. Eight years ago, I reluctantly moved to Silver Spring, in Montgomery County, from downtown Baltimore. I had just had a baby, and my husband and I wanted to be closer to Washington, where we both worked, and to live in a functional school district, which D.C. was not. Although we didn’t realize it at the time, we made a long-term commitment when we bought a townhouse at 2006 prices. Home values crashed, and we shouldered an underwater mortgage through some lean years, like a lot of our neighbors. But if a couple of urbanites had to get stuck somewhere in suburbia, why not here? We can walk to places serving Salvadorean, Ethiopian and Dominican food. Buses come every five minutes. They’re packed — our neighborhood has the same density as San Francisco. As a non-Hispanic white person, I’m in the minority, and I’m used to hearing Spanish and Amharic as much as English. Dense, transit-rich suburbs like Montgomery County and York Region, which I visited recently, are not the rule — yet. But many other places are moving in their direction, and I don’t mean the urbanism lite of shopping “squares” and passably walkable subdivisions. Tysons Corner, the ultimate autopia in D.C.’s Virginia suburbs, is reinventing itself, building 42 million city-like square feet of office, residential and commercial space around four new Metro stops. A greatly expanded transit system is in the works for suburban Broward County outside Miami. Bellevue, Washington, is putting in light rail to serve its growing downtown 10 miles from Seattle. These places are all immigration magnets, too. In Retrofitting Suburbia, architects June Williamson and Ellen Dunham-Jones argue that overhauling the North American suburbs — making them compact, walkable and far less resource-intensive — is the challenge of the 21st century. Nothing has the potential to curb climate change as much as suburban retrofits on a vast scale. We’re used to hearing that suburbs are the problem. Could they also be the solution? It’s a Friday in December, and the parking lot of a mall in Markham, in York Region, is jammed. This mall looks different from any other I’ve been to, like a cross between an old European railway station and a huge barn. Inside, it’s a crowded Hong Kong-style market. Tiny, glass-walled stores sell Chinese herbs, eyeglasses and Hello Kitty merchandise. You can eat Cantonese noodle soup and Beard Papa’s cream puffs in the food court. We’re in Pacific Mall, known locally as P-Mall, the largest Asian-themed indoor mall in North America. Pacific Mall opened in 1997 on the site of what had been Cullen Country Barns, a kitschy gift shop and restaurant complex. The mall is a condominium corporation, meaning that retailers actually purchase their own units and can resell them, a setup that’s common in Hong Kong but novel in North America. Interestingly, the mall was built by a non-Chinese developer who smelled opportunity. Units sold fast — people slept outside the agent’s office the night before they went on sale. But the mall’s groundbreaking was delayed by the developer’s back-and-forth with Markham over traffic and parking, and then a political controversy. In 1995, the then-deputy mayor of Markham, Carole Bell, complained that the Chinese were pushing other ethnic groups out of certain neighborhoods and overwhelming the area’s multicultural balance. The Chinese community demanded an apology; hundreds of mostly white residents, on the other hand, packed a town-hall meeting to greet Bell with “thunderous applause,” the Toronto Star reported at the time. The furor over Bell’s remarks was only one episode in the long and contentious run up to the mall’s opening. Many Chinese residents opposed it, on the grounds that it would become an “ethnic ghetto” and that it outstripped local demand for Chinese retail. At the time, Markham was struggling to integrate Asian immigrants into a population of about 160,000. That population has since doubled, and the share of people of Chinese descent has risen. Now the most diverse place in all of Canada, Markham is getting over its growing pains by setting policies for inclusion and using its diversity to economic advantage. The mayor, Frank Scarpitti, has gone on trade missions to China and India. P-Mall has become a major tourist attraction. Scarpitti has sung Cantonese pop songs on its stage. Markham expects to attract another 100,000 people over the next two decades, and planners are getting ready. When I visited late last year, Highway 7, a major east-west artery, was being retrofitted with dedicated bus lanes for its new and expanding Viva bus rapid-transit system. I watched as colorful branded buses pulled up to sleek shelters, in sync with a screen flashing real-time arrival information. In due time, the buses are expected to shuttle between two planned mega-projects, a 15,000-unit high-rise development called Langstaff Gateway that will be 20 times denser than a traditional subdivision, and a 9,500-resident mixed-use complex that already has offices for Motorola and Honeywell. San Francisco architect Peter Calthorpe is the designer behind Langstaff. He says the development will have “the kind of urbanism you get in a city,” with parking limited and incentives for transit plenty. It’s a new way of thinking about places as disparate as Brazilian favelas, South African townships, and yes, Markham, Ontario, a stone’s throw from where Keil teaches. Informal settlements of makeshift homes sprawling across hillsides or dense highway-side hives of homes, towering office buildings and busy streets, these places are the suburbs of the 21st century. “Who brings [that] bicycle in the bike shop? A truck. Where does the truck bring the bicycle from? It’s carried from a warehouse in the suburbs, which the fixie users in the downtowns never see … All these things, the organic food and fresh-roasted coffee beans, they come from somewhere and are being shipped through these [suburban] metabolic landscapes.” Ignoring those landscapes “creates the illusion that we live in these pods of sustainability” in cities, Keil says. The difference between a street and a road is not just semantic. Roads are designed to convey cars from point A to point B, with the ultimate goal being “throughput” of vehicles. A street implies something else: street life, complete with pedestrians and cyclists. Turning a road into a street does not seem like it would be the biggest headache in a multibillion-dollar project, but one such effort outside D.C. in Montgomery County shows the frustrations of urbanizing suburbia. Known as a smart-growth trailblazer for creating urban districts during the 1990s, Montgomery now hopes to build a BRT system, a 16-mile light rail called the Purple Line, and millions of square feet of mixed-use, pedestrian-friendly development. Though the poverty rate in the county is climbing faster than in other parts of the region, it remains a wealthy place, with a median household income of nearly $97,000. It is majority-minority. Partly due to displacement of former D.C. residents by gentrification, Montgomery County has seen strong population growth, although not at quite the explosive rate of York. Now a developer wants to turn a suburban road in Rockville, Maryland, into an urban street. The developer, Evan Goldman, of Federal Realty Trust, has a plan to transform a dowdy strip mall into Pike & Rose, a mixed-use, transit-oriented neighborhood of 13 buildings and more than three million square feet. A six-lane road that borders the parcel, Old Georgetown Road, is barely navigable by pedestrians. But Goldman is adamant that he’s building a city, and cities have pedestrians. That means a street. The problem is, the county DOT unveiled a new design for the road last year, and it’s still a road. The DOT kept all six lanes instead of reducing them to four, as Federal desired, maintained the speed limit at 40 miles per hour, did not include bike lanes, and proposed a sidewalk too narrow for outdoor seating. Goldman protested. County officials and smart-growthers joined in. The urban street they want is right in the county master plan. However, the road is a state road, and the county DOT defers to its state counterpart. The state and the county are negotiating, and Goldman believes they’ll break the deadlock. They have to, he says, because “you can’t get the pedestrian activity unless you build the streets the right way in the first place.” And the success of the project depends on pedestrian activity. Goldman has plans to front Old Georgetown with retail, to serve people walking (he hopes) to and from the Metro. Goldman’s vision fits into a new county plan to transform now unwalkable Rockville Pike into an “urban boulevard,” featuring generous sidewalks, slower traffic, street trees and bus priority lanes. It will be the spine of a new intensively redeveloped urban node. All told, this area — White Flint— would gain 10,000 more housing units, enough to require a new elementary school and police substation, plus millions of square feet of office and retail space. The response to this full-throttle urbanization seems almost as significant as the changes themselves. Christopher Leinberger, a land-use strategist and well-known booster of walkable urbanism, recalls an early meeting of current residents and the developers, in which the residents demanded a walkable, mixed-use environment like that in nearby Bethesda and Arlington. “They were practically pounding the table,” Leinberger remembers. Thanks to the rewrite, the county will have 300-foot-tall towers near the Metro and a new network of secondary streets that break up old superblocks. Major retrofits require big gestures like these, but as Dunham-Jones points out, the best projects have a texture that comes from smaller interventions. Reusing older buildings, for example, can avoid the problem of “instant urbanism” — a neighborhood that looks like it came out of a box. Pike & Rose may suffer that problem until it has some time to mature. Transportation infrastructure and money are other issues. Building a transit system typically requires layers of local, state and federal funds. Montgomery County Council voted 9-0 in favor of BRT last year, but it hasn’t allocated any money to the plan, and is still waiting on a requested infusion of state funds to perform an initial study. Even in a best-case scenario, BRT will lag behind the new development. Meanwhile, Pike & Rose alone will have 4,000 parking spaces. It could become a drive-to destination, although the master plan counters this by requiring a higher share of local transit use before developers can proceed to the next phase of the project. Last fall, in a rare example of the inter-governmental collaboration that Orfield and Luce recommend, Montgomery County, Prince George’s County, Maryland, and the District of Columbia got together and agreed to try to raise their minimum wages in tandem. It worked: The municipalities passed bills within days of one another. Few suburbs could morph as rapidly as Montgomery and York have, and perhaps few will want to. They’ll go slower, or only halfway. But the preference of millennials and boomers for urban living, combined with city-center gentrification, will stimulate demand for urbanized suburbs. Meanwhile, in York Region, Keil keeps talking, writing and teaching on the suburbs. York University is now graduating planners with a keen interest in all things suburban, including people who grew up in the area and want to make it better. 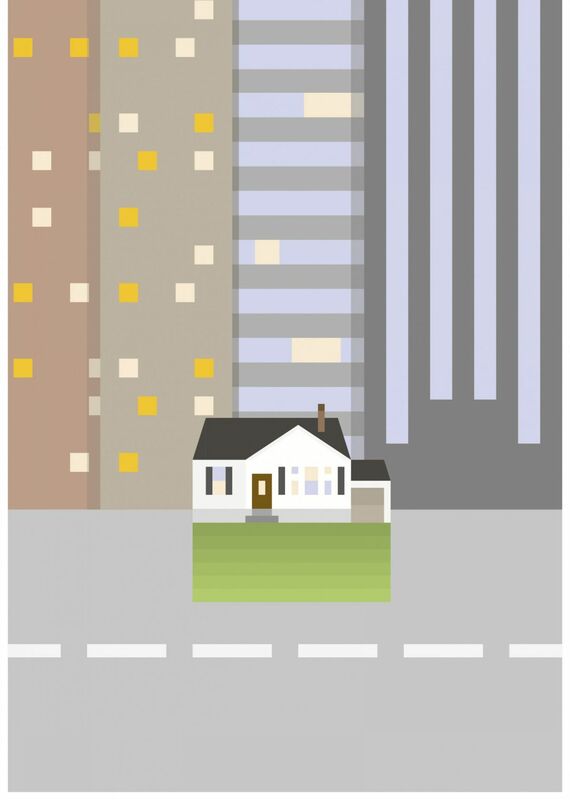 His conference last fall drew 200 attendees from around the world and the University of Toronto Press is readying to publish a “Global Suburbanisms” book series. A former student of Keil’s, an urban planner named Sean Hertel is leading a “Make Rental Happen” campaign to spur ideas for rental housing in York Region. Hertel also coordinates the Greater Toronto Suburban Working Group, a first step toward more collaborative governance to address suburban challenges. My own suburban future may have been sealed on that trip to York. Before heading back to the airport, I went into the city to see a friend. He asked me to meet him at Wychwood Barns, an art space and market housed in a renovated streetcar depot from the early 20th century. The weekly farmers’ market was in full swing when I arrived, and I realized what I love about cities: handsome buildings with old bones, urban fabric that’s become fine-grained over time. I also realized what this market and this crowd lacked. After the cosmopolitanism of P-Mall, throngs of white people buying Ontario-grown beets seemed a tad parochial. At one stall, a skinny-jeaned barista sat on a bike, pedaling hard to power a coffee grinder. I remembered Keil’s parable of the fixie, and wondered: Which unsung warehouse in the suburbs shipped him the parts? Dennis de Groot is an illustrator whose distinctive style is characterized by reducing subjects to simple forms and colors. Strongly influenced by contemporary pop culture, his work aims to explore the line between recognition and detail. In 2011 he published his first book “Bare Essentials”, a collection of pop culture illustrations, with Lebowski Publishers. Most recently, he collaborated with apparel brand Lacoste on two exclusive shirts for their Fall/Winter 2013-14 Kids collection. Dennis resides in Amsterdam with his wife Sherisa, son Seiji and their cat Pixel.